Viva Palestina U.S. | Frances Laing. Writer. Blogger. Journalist. First of January. Janus the god of gates, doors, doorways, beginnings and endings. Looking backwards and forwards at the same time. In December last year anti-war protestors stood together on the streets protesting against the Gaza massacre. After closing and controlling its borders, we heard news of Israel brutally bombing and then invading Gaza. ” Since the attack, which destroyed houses, wells, factories, schools, hospitals, police stations and other public buildings, the blockade has created conditions of genocide through contamination of water supplies due to white phosphorous, raw sewage pouring into the sea, and the prevention of food, medical and other humanitarian supplies from entering Gaza. People living in Gaza are already feeling the terrible long-term effects including a huge increase in birth defects and in cancers, especially in children”. Over the past year many of us made trips to Palestine in solidarity. To bear witness. To bring food. To film and to write the reality. I would have wanted to be there too. For the present – and this time – family circumstances did not and do not allow me to go the distance. I had to travel to Palestinians online instead. Travelled in my head each day to the month-long protest that took place at the Rafah border organised by the International Movement to Open the Border. To speak to the women who sent me messages and photographs. Posted twice, three times a day – learning there were some things that would never see the light of the mainstream press. Began to understand why no-one would pay a writer to write about it. Followed the story anyway. Days and days and months of it. “ Obama’s failure will only increase over time. The troops in Afghanistan will be doubled, as well as the loss of lives of Americans due to this careless policy. The American-made Iraq will never exist. Palestinians will continue to be denied their inalienable rights granted by International law and a Palestinian state will not be realized in the near future. Gazans will remain suffering under the internationally endorsed siege, with its children continuing to be killed and starved. All of this is due to American foreign policy, which is concerned with economic and material self-interest rather than humanitarian concerns. Indeed, neither Barack Obama nor the American government will solve such problems as they remain bias and supporters of the victimizers against the victims”. Last year I started out thinking I had the freedom to write the truth as I saw and heard it. A late night phone call from a government office shook me out of this particular day-dream. It wasn’t that simple. This month I read: “the Gaza Freedom March coalition mobilised an international contingent of over 1,300 international delegates for a non-violent march alongside the people of Gaza which was planned to take place yesterday”. I read: “The Egyptian Foreign Ministry informed the organisers on December 20 that the Rafah border will be closed over the coming weeks into January, and that they will not be able to enter Gaza. Egyptian embassies and missions heard a clear message from supporters of the march by phone, fax and email. Let the delegation enter Gaza and let the Gaza Freedom March proceed”. I’m thinking: This place is familiar. The author of the blog GHAZAWIYYA has the following to say (see this link for the source – quote unedited). “The Viva Palestina convoy should not have accepted to leave to Lathqiyyeh in Syria based on what Egypt demanded they do. This is not resistance. 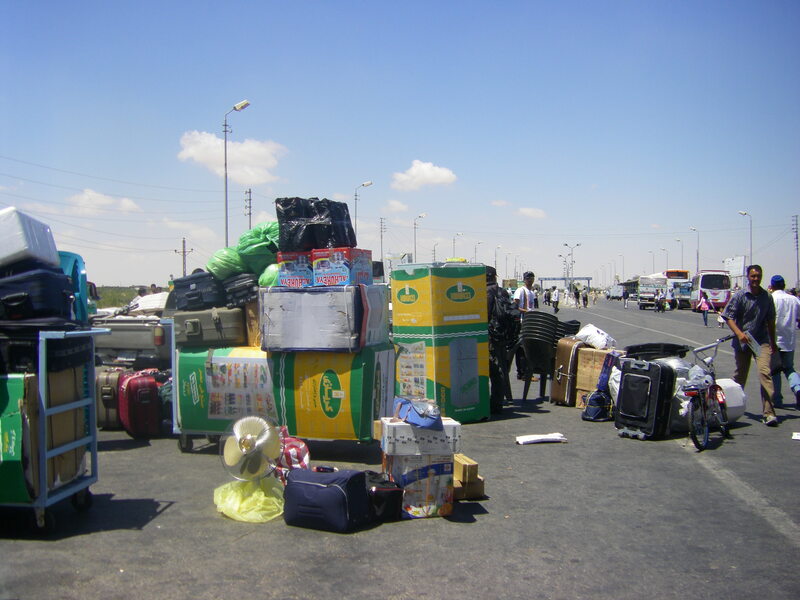 The convoy should have held on their demands despite the Egyptian regimes refusal to allow them to pass through Nweiba’. What the Egyptian authorities are doing is to put off people, and they are succeeding in doing that as long as their is no persistence and resistance. Now, one other thing I would like to criticise Viva Palestina’s Alberawy for is his statement that the convoy is “humanitarian and in solidarity” that does not wish to pressure the Egyptian government! Not that I am for the humanitarian discourse, but, I mean isn’t it humanitarian enough for Mr. Alberawy to uncover the Egyptian regime’s injustice and corruption? Yes, that’s true, a second convoy entered Gaza, with a small part of what had been planned to bring in, as humanitarian help. At the Rafah border, unique passageway between Palestine and the rest of the world, we saw the arrival of two buses, full of United States citzens..
_ that did not want to stop at the border, in order to help Palestinian people to enter their land, nor they protested against the bullying of those people by the soldiers..
_ that were numerous holding flags.. NO, not the Palestinian flag ! They held the flag of the USA ! Yes, the one that floated over Saigon, Kabul and Bagdad..
so they did not even talk to Palestinian people in Egypt..
Let alone the international camp that demand the end of the siege !All communication with them had been forbidden by Egyptian authorities. by the political representatives of a worldwide power (which is also economic, financial, military, diplomatic and mediatic). If Egypt is the country that receives the biggest grants from the USA (barely smaller than the one received by the zionist entity), it is to break the resistance of the (Palestinian AND Egyptian) people. The egyptian henchman is used to make the hard job and let us believe he is responsible, make us forget the israelian crimes and the utter complicity of the empire (most of the governments, but mainly usa and europe). If you call on egyptian embassies, do not forget to call on your own governments and representatives as well. Why is the empire so afraid of the international camp for the end of the zionist siege ? It is like Asterix’s gaul village. A tiny place of invincible resistance against occupation. A seed of Palestine germing and forming an ear of wheat on the other side of the barbed wire.. and that only wants to grow in a wheat field. It is international ! People come from the usa, France, Italy, UK, Denmark, Morocco, Sweden, Barhein, Germany, Palestine.. from everywhere in the world and of course from Egypt. It is dangerous ! cops and soldiers advise Palestinians (and others) that anyone that would talk to us, would never be allowed to pass (the border). As a matter of fact, anybody, normally used to submission, when in touch with us, might be contaminated by the taste of freedom and justice. It is civil society’s child (like the Caravan for Palestine in 2005) and that is why it is ignored by governments, media, parties and even big groups which claim that they care about Palestine (but do not support an elected government because they do not think like them.. my, my, my !). _ gather and spread information about the siege, about zionism. About Palestinian resistance and the means to support it. About the demand of the end of the siege, which is a question of life and death for Gaza, for Palestine and for Humanity. _ organize wider and wider news networks because media only broadcast lies and people need to know the truth. For instance that Egypt is already occupied territory, particularly Sinaï. If we do not resist, they will treat the whole planet as they treat Palestine. _ gather financial support, collect money, in the neighborhood, at work, at school, at the yoga club, etc. _ pay for the travel expenses of one or more members of the committee. If there is some money left, you can help other groups or take it to Egypt and help Palestinian wounded, etc. _ and go straight away and join the camp for a day, a week or a month. To stay in that magic place and live practically, with body and soul this ideal of justice that we all share in our minds. the war of the money on the human being ! Now, some words especially for the people on the front line, my friends on the camp, my brothers and sisters on the Palestinian border, feeling every day, in their flesh and spirit, the injustice and pain caused by zionism, by racism, by arbitrary decisions taken in order to bring a whole people to their knees. What we realize when we are in Rafah, is that this resistance, which is, at the moment, mainly Palestinian, will never surrender. All the attempts to kill it only make it stronger. And in the camp, you feel, as nowhere else, how much you are part of it, how deeply you belong to this marvellous adventure of the human heart. And in the camp you feel as nowhere else, how much you are part of it, how deeply you belong to this marvellous adventure of the human heart. You, at the border are the proof that Palestinian strength and determinatin to resist are spreading all over the world. You are the representative of the increasing consciousness of the absurdity of this world governed by money and war. You are holding the banners of Palestine, Justice and Liberty. You bother the army because you “are singing to live in a peaceful world”. You “are ready to live in a peaceful world”.! “Yesterday, July 15, should have been a day of rejoicing here at Rafah Gate because the Viva Palestina convoy had finally been authorized to enter Gaza, but it turned into a nightmare for the many Palestinian families held up on the Egyptian side. Finally, at 10 pm we were smiling again when we saw Jenny Linnel and Nathalie Abu Chakra, two members of ISM-Gaza come through the Gate. The Egyptians had been denying them entry because they had arrived in Gaza on board the ships of the Free Gaza movement. For those who don’t know the Rafah Gate, the frontier between Egypt and Gaza is situated in the middle of nowhere– 2 kilometers from Rafah. There is no hotel; the Egyptian police have closed the town to foreigners and have installed dozens of checkpoints—I would say one every 50 meters! And you can’t tell me it’s to stop contraband headed to Gaza because all the pathways leading to the tunnels are wide open. Large numbers of Palestinian families denied entry for weeks on end–or longer—are forced to live in hotels in El Arish, a seaside resort 40 kilometers from the border. Because it’s high season, the hotels have hiked up their rates, so it costs these families a fortune. And that’s without the taxi fares. The price of a taxi between El Arish and Rafah is anywhere from 35 to more than 100 Egyptian pounds, and if you want to avoid the checkpoints, it can run to close to 300 pounds. Among these families are Palestinians living abroad who have come to visit their families, to attend weddings; others are returning from hospital stays in Egypt or abroad; there are also young people who have finished their studies etc….Everyone has his or her own story. Elated at news of the arrival of the Viva Palestina convoy, many of these families, exhausted and in debt, came today to try their luck at Rafah, hoping that the Egyptian police would be more lenient and that they might be able to get some help from members of the convoy. But that was, unfortunately, not the case: for these families the day turned into a nightmare. They had arrived early in order not to miss the convoy, so they waited all day in the scorching sun. The first members of the convoy began to arrive around 2 pm in buses under heavy security. Then the horror began: at this very moment, the Egyptian riot police set upon the Palestinian families them and began forcibly evacuating them. People were shouting, screaming, weeping—and the cops kept on beating them savagely. 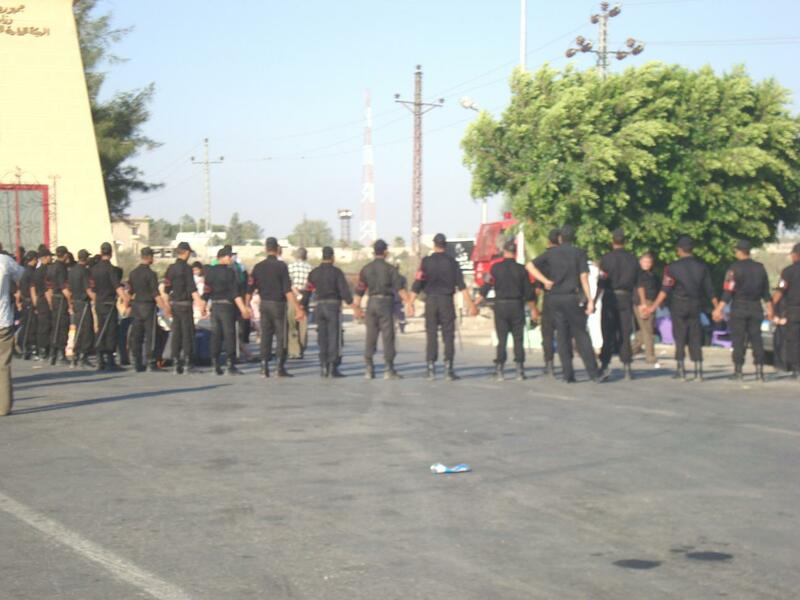 We tried to slip into Rafah Gate in the midst of the confusion. We even succeeded, but were then dragged back out. The scene we were witnessing was once again so shocking that (someone with us) furious, was shouting insults at Mubarak and his minions. A man in the bus called out, “I’m a Palestinian.” And one Palestinian woman, stuck in Egypt for many days couldn’t help saying to him, “Oh, fine, you’re a Palestinian from America and I’m a Palestinian from Gaza. You can get in and I am not even allowed to return to my home in Gaza.” By then the Egyptian police had arrived and they pulled Leila and this woman out of the bus. No contact between Palestinians and foreigners. That has been the order of the day every day since we pitched our tents here at Rafah. We can understand the attitude of the members of this impressive convoy, with its buses, refrigerator trucks and vans. It has been so difficult for them to get this far with half of their humanitarian aid(the other half was confiscated in Alexandria) that it was hard for them to jeopardize delivery of the remaining supplies by attempting to help the people they were watching being beaten up before their very eyes. They would have been heavily penalized—they would have been refused entry into Gaza. How can one comprehend Egyptian policy? How can one understand these Egyptian policemen who viciously beat the Palestinians and treat them like sub-humans, like enemies? Why prevent the Palestinians from returning to their own homes? Who gives the orders? Why not tell them what procedures they need to follow? And, by the way, is there one? We have asked these questions countless times, and each time we got a different answer. The only thing we are sure of is that the Egyptian authorities are pathologically corrupt, that they collaborate willingly with the Zionist entity and that they lie to their police force and army units to make sure they keep mistreating the Palestinians. We are going to wait for the return of the Viva Palestina convoy and we hope they will not be satisfied with 24 hours in Gaza, because the border is still closed, especially for Palestinians. PS : A good news : Kefiah Ib Mousa Hamed, the Palestinian woman with kidney problems we found lying on the ground in front of Rafah gate some days ago came back and was the only one to be allowed to enter into Gaza. Greetings from the Rafah border. Just think—Jenny and Natalie are right here with us in the camp! They are finally free. These two marvelous women brightened up our day! We hugged and kissed and talked about all sorts of things., we took pictures and filmed. We were all so happy. This is just a quick update to let you. Please forward this.” (Message from International Movement to Open the Rafah Border). “The Viva Palestina U.S. convoy entered into Gaza with half of the aid (the Egyptian authorities stopped it in Alexandria). The Egyptian police pushed Palestinian families away from the Rafah border by force and denied them entry into Gaza”. The Viva Palestina U.S. Convoy has reached Rafah. Just ‘finishing up bureaucratic requirements at Rafah crossing’ – see this link. U.S. Gaza Convoy completed bureaucratic obstacle course? Our taxdollars at work!! Viva Palestina!! “It takes place at a border, a checkpoint: in short, at any one of those modern barriers where identities are checked and verified” (Rashid Khalidi in journalist Lala El-Haddad’s blog: Diary of a Palestinian Mother – see my post of May 12th, 2009). People want peace. So many of us want the borders open, children fed, and people cared for properly. So what about the worldwide Palestine solidarity movement? How much bigger does this vast, international solidarity movement need to get for President Obama to notice it and take action? How long will the convoy be able to keep going? How much food and medicine will be wasted? How many more (children, parents, sisters, brothers) will die in this global political and bureaucratic mess before the ‘right forms’ reach the ‘right people’? And what are the vested interests that encourage the British government, the United Nations and the European Union to prop up a repeat performance of this cruel smokescreen-charade? “The Viva Palestina U.S. convoy has been facing barrier after barrier in recent days despite having initially hoped to cross into the Gaza Strip this morning. The Egyptian government, collaborator in Israel’s severe blockade for the past 2 years, has set up a course of administrative obstacles which will delay the group’s entry into Gaza” (For more see U.S. Viva Palestina site). Viva Palestina U.S. is calling on friends and supporters to gather outside Egyptian consulates across the U.S. on Tuesday, July 14, as they make their way toward the Suez Canal and into the Sinai Peninsula to deliver humanitarian aid and medical supplies to the people of Gaza.